Just turned 39 and don’t feel a day over 25. Age is a crazy thing, it just keeps going whether you want it to or not. One minute I’m three and wondering around our Idaho property following our big Husky, the next I’m 18 and wrestling every weekend, the next I’m married with four kids and all of the sudden my oldest is 14 and I’m in Seattle starting a church. Where does it all go. It seems time passes just about as fast as that paragraph describes my entire life. It’s funny how people hold an image in their head about you. I am just recently making some new acquaintances with old high school friends, actually they probably wouldn’t have called me their friend back then, but because they are my friend on the fabulous Facebook, we are good pals now. Whatever. In their head they still see Keith Carpenter at a whopping 130 lb, all wrestler physic. They probably wouldn’t recognize me if they walked past. It goes with attitudes also, I am sure many who haven’t seen me in years still attribute my teenage personality to ancient 39 years. But, oh how time can change even that. Sometimes, especially recently, I have notice that I have become much more serious about life, maybe for the good and maybe for the bad. I am sure the burdens of planting a church in a major American city, caring and protecting my family, feeling responsible for those who came with us, feeling like I don’t know enough, spending hours meditating and writing on doctrine and theology, and truly discovering why I believe what I believe, and being pressed in on by the enemy, has something to do with it. But I don’t want to be all serious and not laugh. I don’t want to be a grumpy old Christian who doesn’t find anything funny any more, because I have taken or been thrust into a heavy load and much responsibility. I want to continue to be able to see the beauty in life and laugh at the small stuff and and the big stuff. I have been finding myself falling asleep at night expecting God to work in our lives the next day but know that I have so much to do and at any moment our money could run out and we would be looking at a forecloser in the face. Although, at the same time I do not worry. I am so confident that we are doing the right thing. God has continually made it clear that we are in the right place at the right time. Maybe I just need to lean on him more and less on my own strength and abilities and finding confidence in what he is doing in my life and the life of Epic Life Church. Maybe it’s not as bad as I am making it. I just feel serious about everything right now and honestly, it kind of bothers me. Birthday #39. Seriously I love my age, my cup is running over and God is my Father. This is the year to Live an Epic Life. Well…that is probably the most personal I will ever get here in my blog. We are approximately three months from our Winona departure date. Time is flying by so fast and we have so much to accomplish. My “To Do” list seems to have two items added to it every time one item gets checked off, which makes for a seemingly never ending catalog of the important. This is so hard because I don’t want to check out on my ministry and students who are counting on my leadership while I am still in Winona. It’s definitely a tough place to be. There is a new tension in my life. A desire to finish strong, here, but a longing to begin, there. The tension exists the fleeting moments of dawn; in moments that don’t seem so fleeting in the present. Yesterday it was sunny and warm outside and it seemed that spring was around the corner and I could start planting a garden any day. Today, it’s snowing. Can’t till the garden up yet. The weather seems to correspond with my life. I am so looking forward to Spring, but Winter hasn’t ended yet. Not to confuse Winter with a negative connotation, but as a season of beauty. I have to finish one season while the next season is presenting itself. Just like this Minnesota weather, spring one day, three feet of snow the next, melting away the next, freezing to ice the next day. It’s frustration and beauty all wrapped into one piece of magnificent art. Like a painting you have to gaze into for a while until the meaning appears. 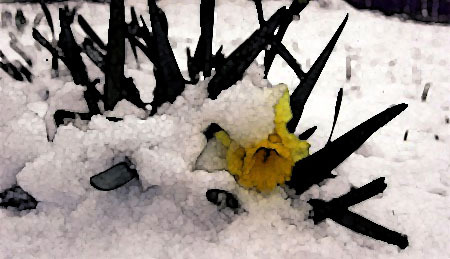 A painting of the motion of change; a boy becoming a man; the process of revelation; of snow on daffodils. This master piece is beautiful while it’s being created. It will be so wonderful to look back one day and see and understand the sculpting and shaping of His magnum opus. Time is a crazy thing isn’t it? It is an intangible influence on our lives. A continuum with no spatial dimensions. A series of repeating instances. Moments stacked on top of each other. We measure it by attaching seconds to it and relating it to the sun and the rotation of the earth and the speed at which our hair grows. Time is real but we are unable to grasp it. Time exists but we are unable to see it, unable to taste it. But like the wind we can see the effects of time. Time is like a prison that we are trapped in here on earth. We can’t get out of it. We can’t escape time and the ravishing affects it has on our bodies and the world, even though it never actually touches us with its bars. We dream of time travel where we can control time but in reality time controls us. We are at its mercy. We are slaves to Time, the always present master, a physical beating that never seems to ends. Trapped, like a fly in the web of an anorexic spider, like a student in the class of some psychotic professor, like a climber on an unending mountain, like Macaroni in cheese. I believe our spirits cry out for something greater, something less intrusive on our lives, something—– possibly something like eternity—where there is an absence of time, a place where the concept of time is unexplainable, unimaginable, and the thought of it sickening. We long for eternity so much that we often forget that time has us in it’s grasp, like a fish freshly plucked out of the water by an eagle, like a new toy in the hands of a child, like peanut butter in a sandwich. We often don’t realize what happens to us as we travel through time.